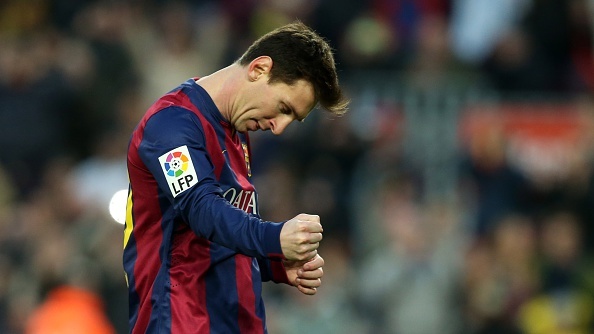 Barcelona thrashed Levante 5-0 in La Liga on Sunday night with Lionel Messi scoring a hat-trick. Neymar opened the scoring before Messi scored three goals and Luis Suarez finished things off with a bicycle kick to help the Catalan club close the gap to Real Madrid to just one point in the table. The match also saw a number of milestones and records being set by Messi and the Blaugrana. 1) This was Lionel Messi’s 300th La Liga match for Barcelona – 225 wins, 46 draws and 29 losses. 2) Messi has now scored 269 goals in the league for Barcelona – 34 penalties, 9 headers, 38 goals from outside the box and 13 goals from direct free kicks. 3) In 20 games against Levante, Barcelona have scored in each and every match – 63 goals in all. 4) Messi now has 34 career hat-tricks for Barcelona and Argentina. He is ahead of Cristiano Ronaldo who has 30. 5) Messi also equalled Ronaldo for the most La Liga hat-tricks with 23. 6) In Spanish club football, Messi has 31 hat-tricks in all competitions – tied with Telmo Zarra (31) and ahead of Alfredo Di Stefano (28) and Ronaldo (27). 7) The hat-trick against Levante was Messi’s fifth hat-trick of the season. 8) Barcelona have won 11 matches in a row in all competitions – the first time they have achieved the feat since 2008 in Pep Guardiola’s first season in charge of the club. 9) Messi is currently on a goalscoring streak at the camp Nou – 17 goals since Barcelona’s 5-1 win over Sevilla in November 2014.